Welcome ! Paragliding in Australia has one internationally famous location and Manilla is it. Whether you are a pilot coming to fly XC or keen to take a course and learn to fly at one of the best flying schools in the world, Manilla has got it all ! This is the World Wide Web site of the Manilla Sky Sailors club. Information on our pages will give you enough reasons to visit Manilla, the premier hang gliding and paragliding location in Australia, not only by surfing the Internet, but by coming here to fly for real ! You can learn to fly paragliders with one of the worlds best schools operated by the most experienced and famous pilot in the country - Godfrey Wenness (he also own's Mt Borah !). Not only that but you can also learn to fly trikes, ultralights and gyro's at the Manilla Sky Ranch with Australia's most qualified UL instructor, Willi Ewig ! 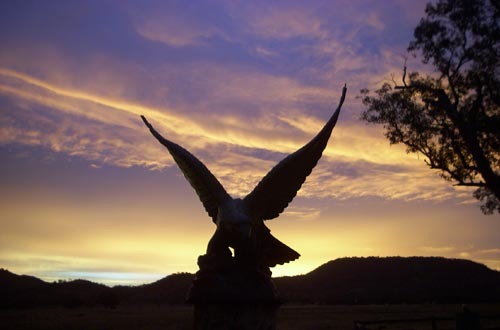 The friendly Lake Keepit Soaring Club also offers gliding joy flights and courses. Paragliding and Hang gliding pilots use rising currents of warm air called 'thermals' (just like the eagles do!) to provide lift. By finding a number of these thermals, a cross country flight can be completed with height gains up to 10,000ft (3 kms)! The 'Big Sky Country' of North West NSW (5hrs drive from Sydney) is ideal for such flying, and the launch location - Mount Borah - is one of the worlds best. Mt Borah with its 4 unique large and safe astro-turfed launches, and easy landing areas, also provides great ridge soaring for all levels - the perfect combination ! 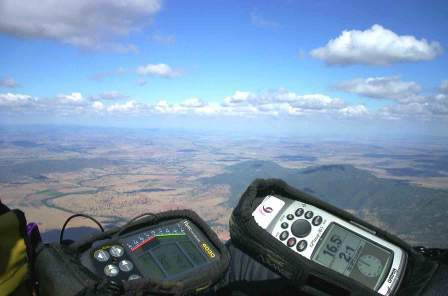 Mt Borah is and has been home to multiple World Records and Australian National Records (see Records section in the Information tab) and hosted the Paragliding World Championships in 2007. It also attracts pilots from around the world seeking some of the best (and safest) cross country (XC) flying to be found anywhere. You are invited to come along and fly Manilla's Big Sky Country ! Paragliding World Championships: Manilla 2007 ! Godfrey Wenness with Olivier Brughelle CIVL President. Mt Borah has undergone a A$392k facelift for the 2007 Worlds. The East access road is now 2WD'able and gravelled. The 4 launches and toilet block project is completed with over 15,000sqm of astro-turf laid on over 5000 tonnes of fill to re-shape the launches. A web cam has been tested but has power supply problems..its suspended for now. Godfrey Wenness at Manilla Paragliding. Ph 02 6785 6545, email: Click here ! Niel Farr at Manilla SkyRanch. Manilla hosts Round 1 of this 3 part Paragliding World Series from 14th - 21st Feb 2009. Over 100 pilots will compete by flying open distance flying every day in what is the largest event on the Australian paragliding calendar. Held annually over the easter long weekend (10-12th April 09), this event is directed towards novice and intermediate pilot participation in a easy going XC open style competition. Bonus point ensure that all pilots have an equal chance of winning. The event also involve's classic state vs state rivalry and this year a team from Sotuh Australia will compete against NSW and QLD.